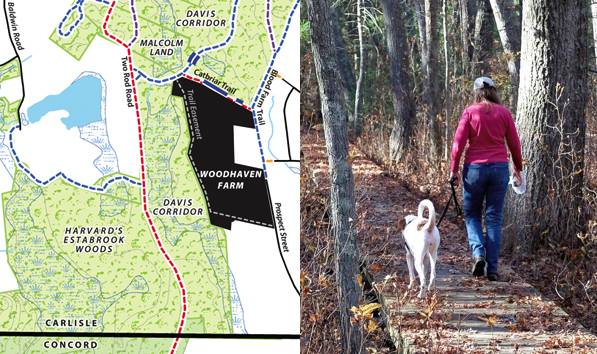 Our annual appeal this year is dedicated to preservation of Woodhaven Farm, a beautiful 28-acre parcel of former farm and forest land on Prospect Street to be protected by a Conservation Restriction (CR) jointly held by Sudbury Valley Trustees (SVT) and CCF. This CR will be purchased entirely with private funds and grants. We are proud to partner with SVT on this project, and continue our working relationship that resulted in the successful acquisition of the Elliott River Preserve. We appreciate your generous support of this project! The Sorli family farm on Westford Street has long been a focus of conservation planning by the family and the Town. CCF and the family have agreed to preserve, under a CR, a highly-valued and scenic 20-acre portion of the farm on the south side of the street. CCF, in cooperation with the Conservation Commission, will request Town Community Preservation Act funds for purchase of the CR; if approved, the property will be protected by 2017. The open field and wood of the Sorli family farm on the south side of Route 225. The trail easement would follow the stone wall at the edge of the field. Spencer Brook Reservation has a new trail and 60-foot boardwalk, thanks to the Eagle Scout service project of Carlisle Boy Scout Matthew Roberts. Matt spent many months planning the project and obtaining permits. His hard work paid off in September when he led a group of other scouts, parents, and Trails Committee and CCF board members to build the boardwalk and cut the trail in one day. The new trail branches from the existing trail in the grove of wolf pines, crossing a wetland on the new boardwalk, to a lovely open view of the Spencer Brook marsh. Many thanks to Matt and Scout Troop 135 for this addition to the Spencer Brook trail system! fields uncut throughout the summer so that natural plant & animal communities could thrive without interruption. CCF maintained mowed pathway loops at Spencer Brook for walkers throughout the growing season, but left large swaths of open field untouched until fall. CCF will continue this mowing schedule again next summer & fall. Matt Roberts (center, left) oversaw the work of the many volunteers who helped bring his vision to fruition. 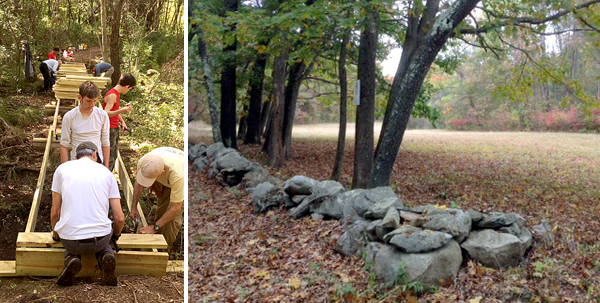 A CCF work crew recently cleared vegetation from the stone wall along South and West Streets at Spencer Brook Reservation (right) to reveal its stonework and improve vistas for motorists. Most of the overgrowth consisted of invasive species, and its removal is a continuation of an ongoing strategy to control invasive species on CCF's lands. CCF is collaborating with NEWFS in this effort. We extend congratulations to Board member Alan Ankers for the 2015 Conservationist of the Year award, and a warm welcome to our new Board member and treasurer, Lauree Cameron Eckler. Our Annual Appeal is our main source of funding for the year. All of your contributions are tax-deductible and go to protecting Carlisle’s wildlife and open spaces for the future.